Brown Bear drew a picture today. Until today his "pictures" have involved using one crayon and scribbling across a paper while saying, "red bird, red bird", "purple cat, purple cat", or "angry bird, angry bird" to get his point across. There have been no meaningful lines, no attempts at using drawings to communicate a message, nothing but scribble. Today he drew a completely recognizable angry bird. The difference between yesterday's drawing and today's is night and day- you wouldn't believe it was the same kid. I never thought I'd be so excited about a drawing of a computer game character. I'm not sure if I've ever been this excited over any artwork I've seen in a museum, and I like to go to art museums around the world. Even when he made it rain playdough and then through a tantrum when he was asked to clean up all the teeny tiny playdough pieces I didn't lose my teaching-high. This is one of the most horrifying articles I've ever read about education. It's about the published test results in NY and how the press reacted to what it saw as the lowest performing teacher- an ELL teacher who was screwed by the statistics. The cold numbers don't tell the full story- and the cold numbers are all anyone looked at. Read it yourself- I can't begin to summarize it without getting myself worked up and irritated. It's the classic example of the damange statistics can do in the hands of people who do not understand statstics and numbers. "As in many other cases, the story of Pascale Mauclair and P.S. 11 begins with a tale of the flawed methodology and invalid measurements of the Teacher Data Reports. P.S. 11 is located at the epicenter of a number of different immigrant communities in northern Queens, and over a quarter of its students are English Language Learners. Mauclair is an ESL teacher, and over the last five years she has had small, self-contained classes of recently arrived immigrants who do not speak English. Her students arrive at different times of the school year, depending upon that date of their family’s migration; consequently, it is not unusual for her students to take the 6th grade exams when they have only been in her class for a matter of a few months. Two factors which produce particularly contorted TDR results – teaching the highest academic need students and having a small sample of students that take the standardized state exams – define her teaching situation." How did we get here? And how do we get back? My 5 1/2 month old baby isn't rolling over yet. She's babbling away, will roll from tummy to back but shows no interest in rolling from back to tummy. I've found myself questioning my patenting because of this one mile stone. "what more can I do to encourage her?" "what am I doing that is inhibiting her?" Then I suddenly realize just how crazy these thoughts are. She'll roll when she's ready. I'm so embedded in the current teaching culture of blame that I can't even consider that there is another being involved here. I'm so use to considering students' success and failure as hinging on my actions that I'm transferring that to my baby. Sure if I hold her all the time she won't have a chance to roll, but that's not happening. It's not the end of the world. She'll roll when she's ready. The blame I was automatically placing on myself shocked me into realizing just how far the teaching culture has gotten into my world view. Have I stopped seeing the developmental needs of children and only see how adults' actions impact growth? Who have I become? I wrote a bit ago about how I'm trying to turn my re-telling center into a more active, imaginative play center. I've been trying to work on ways to increase play in kindergarten for a few years now. I realize now that I was going about it the wrong way. I was trying to make the play opportunities that already exist more academic as a way to justify having play in the classroom. I spent a lot of time looking at Tools of the Mind and trying to work that into different free choice opportunities. I tried to add lots of literacy opportunities into play as well. While this was great in theory, I think I was limiting a lot of their spontaneous free play and was also missing the point. Instead of making the free play that exists more academic I need to put play and play like activities into our other routines. I didn't realize this on my own- this all came from my conversation with Splattypus a few weeks ago. 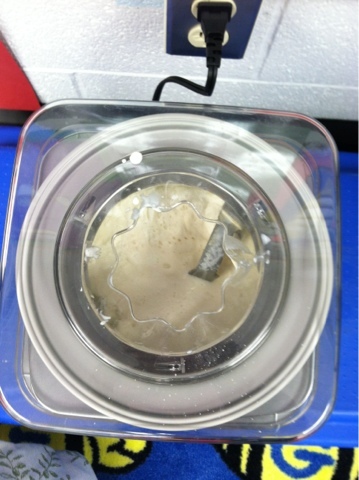 I wrote about creating a center where the children could act out making ice cream as a way to retell the activity. That worked well but after two weeks it was time to put something else in that center. Since we enjoyed a glorious 3 day weekend thanks to Presidents' Day I decided to put my Abraham Lincoln, George Washington, and Martha Washington dolls into a center to allow the children to act out what we are learning in social studies. In my perfect dream world the center would be full of objects that represent the times when they lived. In my dream world it would be mini-American Girl doll sets. Yet actually putting together a set like that is time consuming and expensive. SO... instead I frantically ran around the classroom and threw in what I thought would fit. Lincoln logs, toy horses, a fence, and pictures of both presidents' boyhood homes and the White House. (Yes, the White House didn't actually exist then, but it represents the fact that they both become presidents.) It wasn't perfect and I still have plans of finding more objects to add to the set. When I introduced it we did a quick sort of present and past with the objects. Would a cell phone go into the box? No. Would a dinosaur? No. I demonstrated how to use the Lincoln Logs to build a house for Abe and then stepped away. I had other more important things to do like teach reading. The past two days I've loved eves dropping in on the center. So far the play has been appropriate. I'm hearing the vocabulary that I've taught come out in the play "Hey! You presidents! Go to the White House!" They are using their names and the few facts they know and incorporating them into their play schemes. Sure George and Abe shouldn't actually be playing together. But it's play. If they want to act out George and Abe working together on a farm while Martha builds the log cabin- well, at least they are showing an understanding of past and present and interacting with the information in their own way. I have a hard time keeping a straight face, but I am loving listening to the play. It's also refreshing to hear happy play done in a quiet, constructive way during the reading block. Over the year and this summer I want to work on putting together little sets- a set of the pilgrims, a set for Martin Luther King, George and Abe, and then sets from books we read so that every two weeks I can put another play set into the center. Right now I'm loving this- we'll see how it goes throughout the week. Brown Bear's latest obsession is Angry Birds. He is amazingly good at the game but recently his obsession lays not with the game but with the stuffed version. The first day he came to school with Angry Bird we looked at each other wearily. What would this toy do to disrupt his learning? Fully prepared to have to take it away from him at some point we braced ourselves for the worst but decided not to fight that battle until we had to. Yet within twenty minutes Angry Bird was my new best friend. Anything we wanted Brown Bear to do we just asked Angry Bird to do. If Brown Bear was ignoring us all we had to say was "Angry Bird, sit on the rug" and Brown Bear and Angry Bird would both sit on the rug. Angry Bird pointed to the words in his book with his beak, he did all of his math sheets and waited for Brown Bear when he went to the bathroom. Brown Bear even talks to Angry Bird during transitions, telling Angry Bird where to go and what to do. Somehow taking care of Angry Bird makes the transition smoother for Brown Bear. It is almost as if he can't self talk independently to get himself ready, but he can self talk when he has something to direct his thoughts to. There have been times that even Angry Bird hasn't come through and Brown Bear still has a rough day, but most of the time Angry Bird is an essential part of our class. We traced his shadow for ground hogs day and gave him his own 100 year old portrait. I've never even played the game yet I love that stinking disgruntled bird. 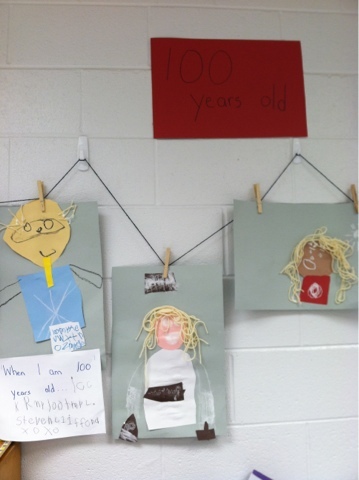 To celebrate 100 days of school we made portraits of what we will look like in 100 years. I saw one of my awesome colleagues do this last year and I had to steal the idea. I'm not sure we quite got the concept of 100 years but these are pretty cute anyway. 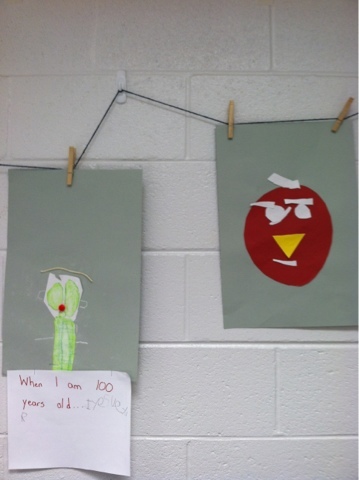 And yes that is an angry bird at 100. More on that later. I realize that some of these may seem questionable, yet I would happily write a justification for each item for the IRS. The random little things that go into good classroom management and instruction far exceeds $200. And I teach at a school who generously supplies most of our needs. Brown Bear was in the midst of throwing a tantrum over having to clean up his play dough. His lower lip was in full quiver and he had started loud moans of protest. 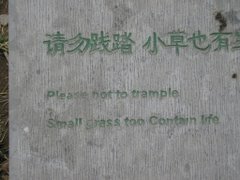 We knew we were in for trouble. In times of strife and struggle what is there to do other than frantically throw on Dr Jean's 'Who Let the Letters Out' song and let the rhythm speak for itself? By the letter B Brown Bear's wails of protest had turned into whimpers. By d he had run into the house keeper center, desperate to fight the music taking a hold over his body. Unable to hold off any longer he yelped with excitement as we got to F and by J he was in the rug with us bouncing around to the letter sounds, tantrum long forgotten. In the grand scheme of the world music trumps anger. The other day I took Baby L to visit Splattypus' new baby. Sadly Splattypus and I completely missed each other on maternity leave- she left for her leave the week before I came back to school- so we never got to teach together this year. As we let our babies "play" (read: stare at each other's faces as we bounced them on our knees and gossiped) we chatted about school and the crazy kindergarten curriculum and how little the kids get to play. Listening to her talk about how academic kindergarten is made me step back- I know it's crazy academic and last year when I was supporting children in their general education classrooms I was able to stand back and see just how inappropriately academic it is. But in my new role as a classroom teacher I feel the pressure to get things done more than ever- and my students are even further behind than their general education peers- and I'm just coming back from maternity leave- pressure, pressure, pressure- time to push, push push!! Even though I sigh at the loss of free play opportunities I've made very few opportunities in my classroom for play- and my kids are the ones who need it the most. When I do let them play I'm sitting behind them with a clip board to analyze their conversation and play skills. 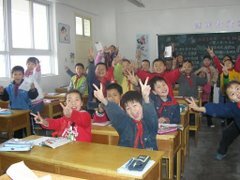 The poor, poor kids in my class. Splattypus had also been discussing ways to put play into the school day outside of just free choice. This got me thinking as well. I have a retelling and sequencing center but some of my kids have a very hard time sequencing personal events using pictures of what we did. I show them pictures of us making ice cream and they have trouble identifying what we did first and last. For many of them sequencing personal events is an IEP goal and so we work on it frequently, but it hasn't been going overly well. For Christmas my father gave me an ice cream maker. This may have been the greatest Christmas gift ever- sort of like the whole 'give a man a fish and he'll eat for a day or teach a man to fish and he'll eat for a life time' parable but with much better tasting food. After some successful attempts at making ice cream at home I decided it was time to attempt it at school. And of course, if we're going to do something fun at school we're going to make it as academic as possible. We made the ice cream on Thursday morning and then waited and waited for it to be ready (waiting is HARD when you are 5 and 6). The evil teacher that I am made them wait until after lunch to taste it- we put it in the freezer to get it as cold as possible. When we were finally ready to eat it I gave everyone two small dixie cups- one of our homemade ice cream and one of a store bought ice cream (store brand of course- I wasn't about to compare our hard work with Edy's or Bryers). We took everyone's opinions on what was best and graphed it to work on our graphing skills. We've been desperately trying to understand the concept of more and fewer and graphs about how we go home just don't really hold anyone's interest. After we'd graphed our class' opinions we put our ice cream on a cart and took our taste-test on the road. We visited the office where we asked the principals to participate in our taste-test. We weren't just working on our math skills- my kids are also working on speaking in full sentences, making eye contact, asking questions and listening for responses- so I figured surveying teachers was a great chance to keep working on these skills. Of course, asking children to walk down the hallway with an ice cream cart is a bit like leading a hurricane across the ocean. We destroyed just about everything in our path with our excitement and energy- but it was worth it. Rock Star practically stormed into my principal's office and demanded that she try the ice cream. Rock Star can be shy and timid around strangers but the ice cream brought out the best in her. Her shyness seemed to disappear and she led the taste test. Other children used full sentences to talk to teachers and came out with expressions I'd never heard them use ("Step right this way"). Rock Star also counted to 12 when she was tallying up the graph (grant it what she was counting was 9 but still, I'd never heard her rote count past 5- I had NO IDEA she could count to 12. She'd been hiding it from us all this time- what else is she hiding?) I heard my kids explain their thinking about reading the graph in ways they hadn't before and we had a few great teachable moments where we got to go over concepts like hot and cold- concepts some of my children have trouble with. It was chaotic but fun and I was taking data like crazy. Now we're working on sequencing the steps of what we did to make ice cream and using full sentences to retell our adventure. Next we'll try to get it down on paper so that we have our own how-to books. There are days when I come home feeling thankful and lucky that I have such an amazing job that I love so much. Then there are the days when I come home feeling overwhelmed, tired, and exhausted. Not that I don't love my job on these days as well, but some days it feels more like a futile exercise in trying desperately to keep my head above water in the face of a hurricane. Today was one of those days. It's not that anything went wrong, or that anything is overly out of the ordinary- it's just that so much is going on. Every one of my children has intense needs and essentially needs a different curriculum than everyone else- it's why they are in my class- and what I LOVE about my job- I truly enjoy planning and creating different activities and different teaching methods for each student. But right now I know I could be doing a better job of it, and I'm living with the frustration that it's not happening as well as I would like. My to-do list seems to be running out the door and even if I do get to everything on it I am not doing it as well as I would like. That overwhelming, creeping feeling of panic is seeping in- a feeling that I'm failing the kids, my coworkers, my IAs, my school, the parents, myself. It's like walking on a tight rope and feeling it suddenly start to shake- the sudden realization that you are about to lose your balance and fall all the while trying desperately to do everything in your power to keep your feet on the rope because falling is not an option. My kids need fast paced instruction or I lose them- but lately I feel like I've been moving inside jello- my brain isn't responding to the environment as quickly as I would like. Reading lessons are taking too long and one moment of hesitation lets the children find an interesting spot on the floor that they'd like to investigate. The paper work is piling up, the list of people to get back to, needs to meet, teachers to confer with, interpreters to line up, people to call. I love my job but I love it more when I feel successful. But we can do hard things. Big sigh.